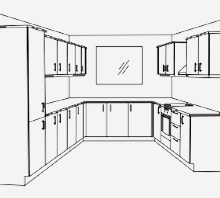 The comparisons we make and the prices we show on Kitchen-compare.com are based on three model kitchens: a 'Galley', an 'L-shape' and a 'U-shape' design. 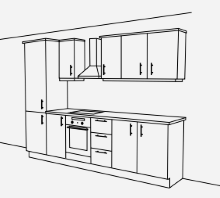 The model kitchens include cabinets with soft close hinges, a 38mm laminate worktop, cabinet handles, decorative end panels, pelmets, plinths and cornice. We don't include sinks, taps or appliances as they are very much down to personal choice and the prices of these can vary significantly across the retailers. The prices we publish provide a good indication of the retail prices you will pay today for that style of kitchen, so even if you change the number of cabinets or add some additional features the best price option is likely to remain the same. 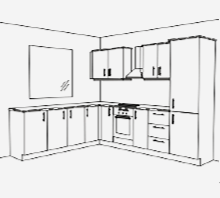 What you see below is the component breakdown of the three unique Kitchen Compare model kitchens. Kitchen fashion can change quickly and everyone likes to think they have chosen a new kitchen which will look as good in ten years as it does today. In our Latest Trends section we show you that whatever your taste, budget or space constraints, there's a design that's going to be perfect for you.